Rube Goldberg, Heath Robinson, and the history of fictional inventions. What fictional inventions say about American ingenuity. 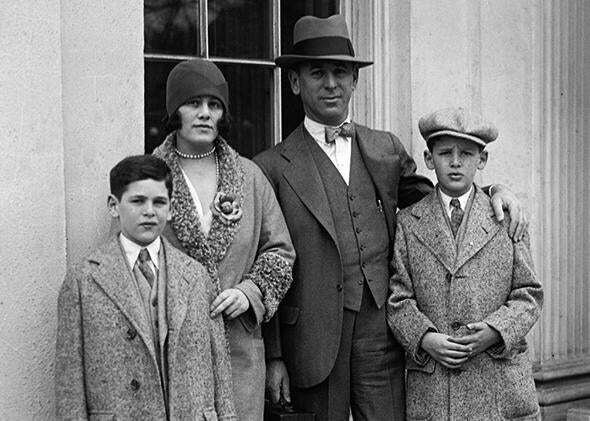 Rube Goldberg and his family on April 4, 1929. Stop me if you’ve heard of these useless products: powdered water, double-sided playing cards, screen doors for a submarine. Ten-year-old me thought that these joke inventions were the height of humor. Twentieth-century popular culture is full of frivolous, ill-conceived, ambitious inventions, as well as clueless or venal inventors. But some of the best invention humor has its roots in the 1920s and 1930s. Why was this period prime time for satirical inventions? In those years, visual culture of all kinds—fine art, industrial design, children’s books, Army recruitment posters—echoed the machine in form or motif. But people were interested not just in machines of the charismatic and visually appealing type (see: automobiles and streamlined trains), but also in the idea of the machine: the mechanical nature of the systems underpinning modern life. Literary nonfiction, newly popular, promised to explain everything to reading adults and children: how leather was made, what chemistry was all about, the entire history of the world in “outline form.” Cutaway illustrations in encyclopedias and magazines directed the eye to follow the interlocking systems that made up complex entities like a hotel, a mine, or an ocean liner. Although we often associate the growth of consumer culture with the 1950s, the 1920s and 1930s were also a time when people’s homes filled with new things. Manufacturers were getting much better at mass production, electrification (in both home and factory) had advanced, and advertising was booming. People began to buy on credit, making bigger purchases possible, and homes got washing machines, toasters, coffee pots. The little things changed, too: Suddenly, homes were stocked with canned goods, rayon clothing, factory-rolled cigarettes, safety razors. This was all very hopeful and utopian, if a bit much. Enter Rube Goldberg, whose satires skewered the new inventions using the technical language of the time. Goldberg majored in engineering in college and had been trained in mechanical drawing. His famous Goldberg devices drew on this background. The artist apparently spent up to 30 hours in planning each, studying actual patents for inspiration. The height of Goldberg’s productivity, when it came to his famous devices, was the 1920s and 1930s; these invention panels were reissued throughout the ’40s and ’50s. In his first cartoons, published in Collier’s magazine from 1929 to 1931, Goldberg had an alter ego: Professor Lucifer Gorgonzola Butts. While fictional eccentric inventors are now dime a dozen (see the TV Tropes list for “Bungling Inventor” or this Gizmodo roundup, for starters), Butts was an early prototype, and audiences loved him. Goldberg has had a huge cultural footprint (see: OK Go; Sesame Street; Final Destination). Often the machines that are now called “Goldberg devices” have lost their satirical edge, offering only the simpler joy of watching a chain reaction go through its paces. But Goldberg’s own drawings were rich with meaning, when read against the backdrop of their time. In critiquing the apparently pervasive desire to “do an easy thing the hard way,” as he put it, the cartoonist was poking holes in the idea that any invention was a good invention. The fantastical nature of the Goldberg contraptions makes the messy thought process of invention visible. The processes defy conventions of time and space, yet are represented with utmost seriousness. The Goldberg contraptions were organic machines, incorporating animals and (sometimes) people. Echoing the behavioristic psychology of their time, the machines exploited basic instincts to chase, eat, or startle, making living things into cogs in a process. Professor Butts’ “idea for removing gravy spots for vests,” for example, counted on a trained seal that would flap his flippers at the sight of fish; a bat that would fly away upon being deceived into the belief that it was night; and flies that would inevitably eat the gravy off of the sullied garment. The animals in the Goldberg machine remind you of the hubris of invention, which tries to predict the unpredictable. Around the time of Goldberg, Russell Oakes, aka Professor I.M. Nuts (or, sometimes, Professor Ratzin de Garrett) entertained live audiences by demonstrating absurd inventions. Nuts’ devices weren’t complicated, like Goldberg’s—they were simple visual jokes. And if Goldberg’s critique of invention was complex, Nuts’ was simple: We are buying machines to solve unnecessary problems. It’s hard not to think that Oakes may have been imitating Goldberg’s style—Goldberg had even written about the danger of the grapefruit squirt—but Oakes was doing something much simpler: critiquing the solemnity of the advertisers who promised to solve everyone’s problems with a gadget. 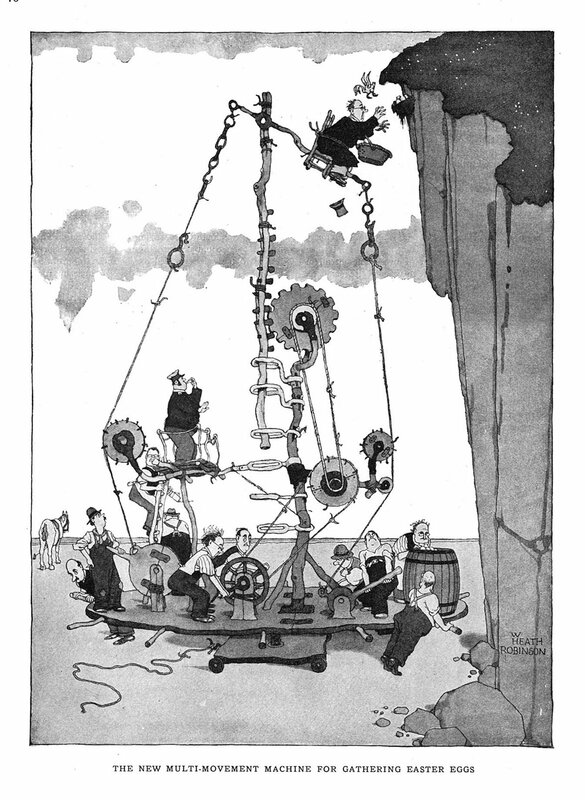 As a Yankee raised on Rube Goldberg, I had never heard of William Heath Robinson, the illustrator whose name is used in Britain to describe a contraption that’s cobbled-together or slapdash (“that’s a bit Heath Robinson”). Robinson, trained as a fine artist and originally influenced by the late-19th-century Art Nouveau style, began his career illustrating children’s books and lavish gift editions. He began drawing satirical gadgetry a few years before Goldberg, publishing in magazines like The Sketch and The Tatler before World War I, and continuing to produce illustrations in that style through his death in 1944. Robinson’s single panels depicted absurd multipartite contraptions helmed by sincere men trying earnestly to make it work (“The New Multi-Movement Machine for Gathering Easter Eggs”; “The Professor’s Invention for Peeling Potatoes”). Unlike Goldberg’s inventions, Robinson’s depend entirely on actual machinery (no flies or seals involved). They teeter and sprawl, always looking to be the brink of falling apart. Olivia Solon, writing about Robinson on Wired UK’s site last year, quoted H.G. Wells, who told the illustrator in 1914: “Your absurd, beautiful drawings … give me a peculiar pleasure of the mind like nothing else in the world.” I agree: Tracing a Robinson machine with your eye, you wonder how it might work, and think about how funny it would be to see it bust into a shower of cogs and springs. During World War I and World War II, Robinson did something that Goldberg and Nuts never did: He mocked war’s apparatus. In narrative panels like “A New Method of Training Young German Ski Troops to Do the Goose Step on the Frozen Steppes of Russia”—an utterly delightful slapstick image from 1942— Robinson satirized the enemy’s pretensions at technological innovation and organization. His drawings of the schemes of his fictional “First Lord,” a British officer charged with undermining the Nazis through vague and complicated plans (“Contemptible Plot by the First Lord and His Gang to Inject Flue [sic] Germs into Field Marshall Goering by Hydraulic Pressure”), highlight the absurdity and contingency of war on all sides. Now, new machines have changed: They’ve vanished inside smooth, uncrackable boxes, or into the hypothetical realm of code. What happens to invention humor at a time when most of the inventions that change our lives are constructed at a level of complexity that makes them opaque to the average intelligent human? There is code satire (see INTERCAL or the International Obfuscated C Code Contest) that does the same thing in the digital realm, but getting the joke requires literacy in that language. The Goldberg, Nuts, and Robinson invention satires work because we can see how they might work. The joy of regarding a Goldberg or Robinson illustration comes in following the steps, working out the feasibility, enjoying the joke at every absurdly baroque solution to a simple problem. We can be very serious about new gadgets and machines, giving their makers fanatical respect. Invention humor helps us draw back a bit from that hero worship. I’d love to see universally accessible invention humor for the digital age. Does it exist? Can it?